Chef stood at his usual place behind the demonstration table. He began to explain to us the methodology of croissants and the work involved. I always knew croissants were tricky and labour-intensive. Every flaky layer is created by pockets of butter and unlike pie crusts, these layers were even and flat, there is no cutting or crumbling of butter in croissants. 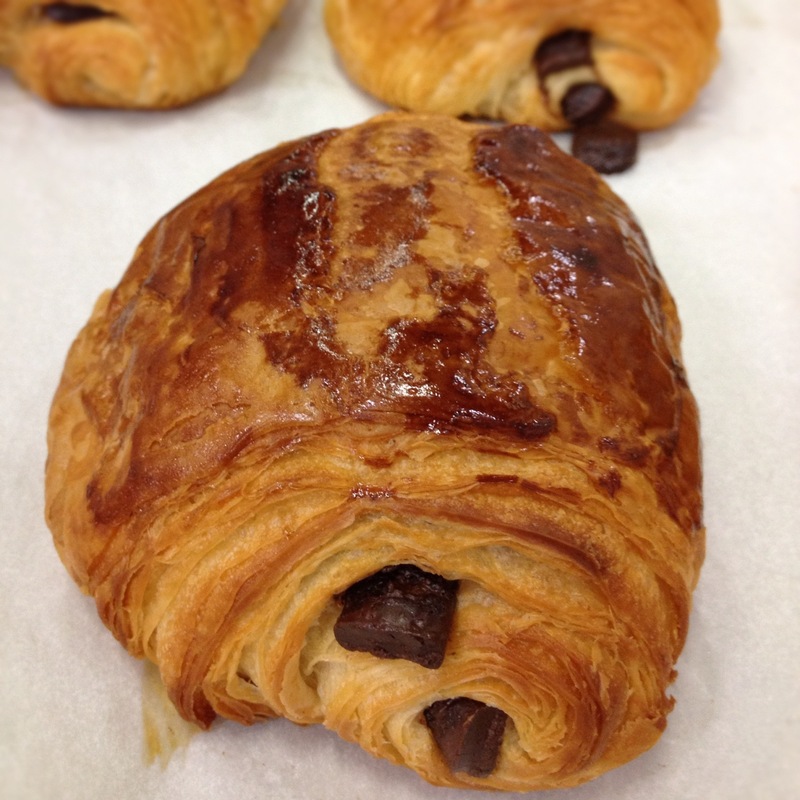 The croissant is started by making a basic yeast dough, it’s not particularly special or butter-rich. It was quickly made in the stand mixer and let to sit out for an hour and a half before spending the night in the fridge. The next day, we were taught how to incorporate the butter into the dough. The amount of butter involved was staggering. It was a brick. Actually, it was a brick plus an additional 10g. I puffed out my cheeks and let out a long breath. My eyes widened at the thought of integrating that brick of butter into the dough. When you consider how much butter a portion contains, it’s not actually that much but to see an entire brick is a bit overwhelming. He rolled out the dough to a large rectangle, approximately 8” wide and 14” long. He explained that based on this size, he would have to create a “butter book” that was around a third of the size. The concept was that you pound out the butter into a thin sheet that would be folded into the dough. It would sit in the middle (with about ½ to 1/4 inch edge of dough on each side) and the two ends of the dough would meet in the middle, creating a butter sandwich, if you will. He pulled out a large piece of acetate, which is a piece of clear, thick plastic film that has many purposes in pastry arts. For example, it’s commonly used to wrap around the outside of cakes for stability and construction. In this case, the acetate would serve as a containment wrapping for the butter to be pounded out. Like rolling out a fragile dough between two pieces of parchment! He measured out the approximate shape of the book (7.5” wide and 6” long), folded the acetate accordingly and reached for his rolling pin. I am sure that in professional kitchens, there are better ways to do this – but to watch this acclaimed chef vigorously beat a pound of butter into submission was oddly thrilling. I guess there’s a certain comfort in the ‘old school’ techniques that connects us to the old masters of pastry arts. After pounding out the butter into a “book”, he carefully laid it in the middle of the dough and folded the ends over it, enclosing the butter. He quickly rolled out this dough lengthwise, back to about 14” long and 8” wide. He folded the dough again, this time into thirds (like an envelope), keeping the open edge to his right. This completed one “turn”. Three full turns are needed to complete the dough before the final rolling. Once you finish a fold (if the dough is still cool – if not, into the fridge! ), roll out the dough again, emphasizing length to fold into thirds. After the second turn, he sent us back to our tables to let us try our hands at making the dough. I sighed. This was going to be tough. But at the same time, I relished the opportunity to bash the heck out of that butter! ← Day 1: Why Chicago?